Fancy snacking on some fried bananas? This is Thai style Deep Fried Bananas. The bananas are coated with desiccated coconut and sesame seeds batter. Then, fried until light golden brown in color. 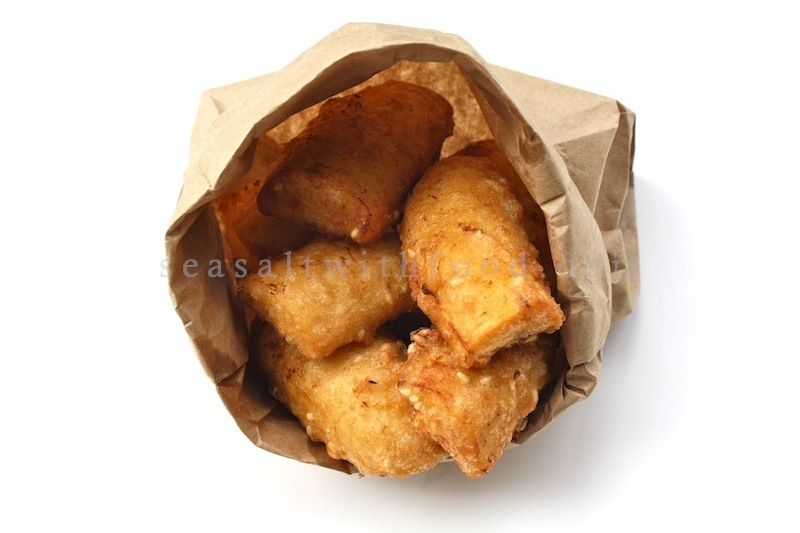 The coating gives these fried bananas the crunchy fritters outside, whilst the fruit remains creamy and sweet inside. Here, I am using the natural sweet Burro banana variety. This particular variety of bananas are popular for making fritters and other desserts. If you can’t get hold of them, then do substitute with ripe plantain. 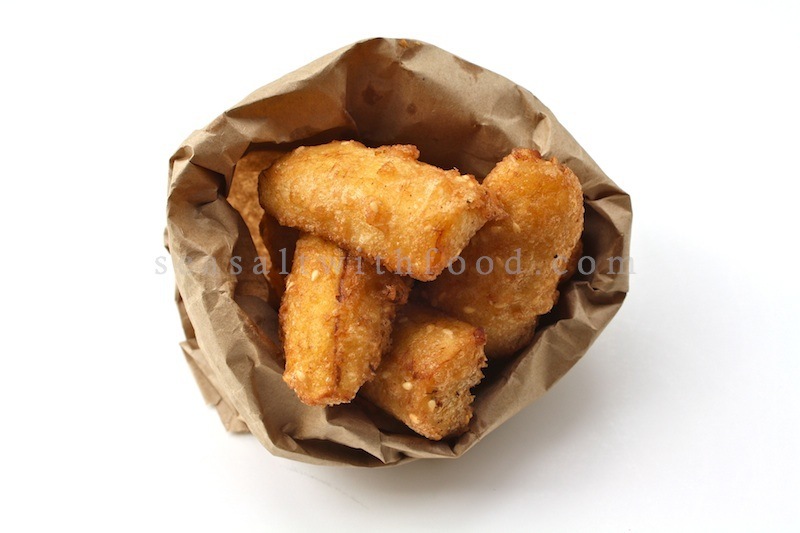 I am sure they will taste just as good especially for deep-frying. Pour enough oil into a saucepan or a in deep-fry on medium to high heat. Coat the bananas with the batter and fry until golden brown in color. 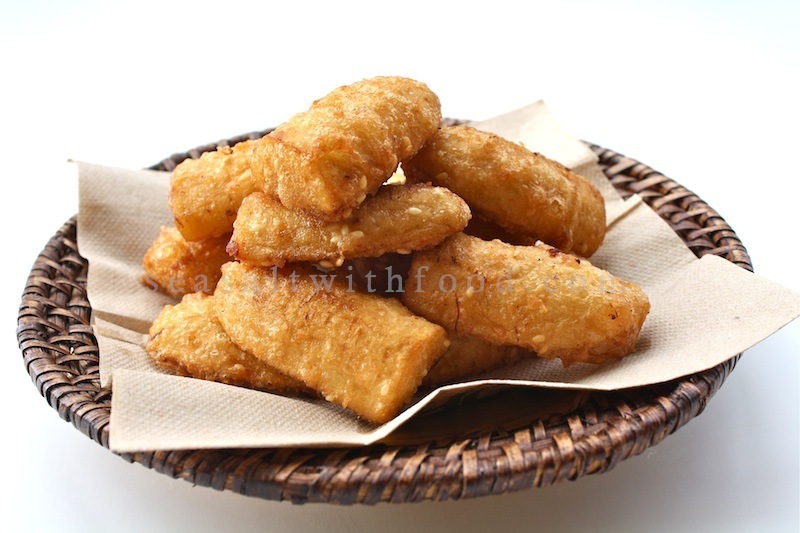 Remove the fried bananas with a slotted spoon and drain on papers and serve warm. I'm intrigued Angie!I am so going to make this, thank you for sharing! And where did you learn this from? These fried bananas are always my favourite. When I was back home I just go and buy it. I can eat this any time of the day.....just so delicious. I have to make this soon. Oh my goodness I love bananas that are cooked any which way. I recently wrapped bananas and nutella in phyllo and baked it. Nothing better! yums... almost as good as Goreng pisang!!! I remember eating this in Bangkok. I like them with sesame seeds. I tried making this the other day using regular Dole Bananas but they were no good. They were so soft and sticky after frying. I have to get some right bananas from the Asian store. Yours were so nicely fried Angie. My mom used to make these for me all the time, yours have fantastic coloring! Thanks for posting, can't wait to try out the recipe! Those fried bananas look so good! How do you manage to coat the bananas with batter and get them into the oil without everything falling apart?